Dolphins beach in Japan: Nearly 150 animals exposed. 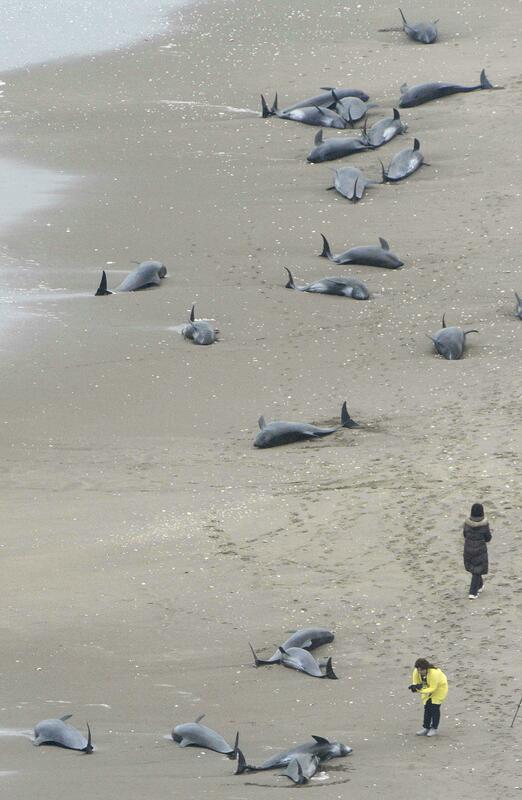 Melon-headed whales on a beach northeast of Tokyo. An AFP journalist at the scene said that despite efforts to get the dolphins into the water, some were being pushed back onto the beach by the tide soon after they had been released … The pod was stretched out along a roughly 10-kilometre-long stretch of beach in Hokota, Ibaraki, where they had been found by locals early Friday morning. It’s not always possible to find out what has caused a particular dolphin or whale beaching, but many animals that become stranded are later found to be ill; other potential explanations include disorientation caused by weather or by sonar equipment. (It doesn’t appear to be clear whether animals who become beached while ill are doing so intentionally or as a result of weakness and disorientation.) The social bonds between the animals may cause large groups to follow those who’ve been stranded initially.